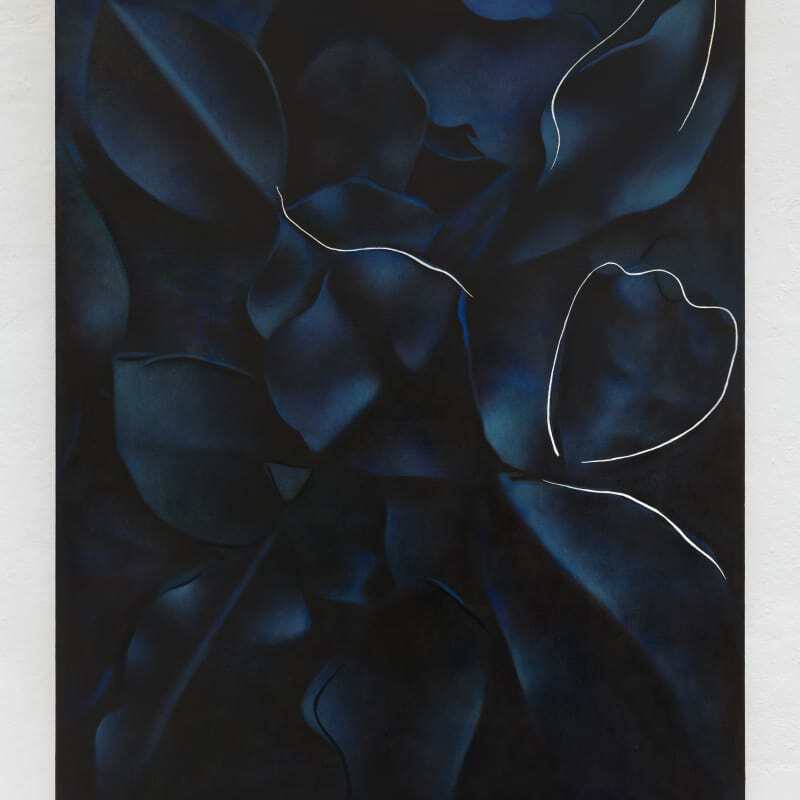 Workplace Foundation is delighted to announce the first solo exhibition in the North East of England of Manchester based artist Louise Giovanelli, opening 25th January 2019. The exhibition will consist of 9 new paintings that refer both to art history and contemporary mechanics of viewing and consuming imagery. Cropped and isolated images gleaned from historical painting are repeated and restated throughout several works, dislocated from their origin and repositioned within a rhizomatic sequence of artworks. Giovanelli employs a layering technique to build composite works that simultaneously presents multiple modes of representation and painterly lexicons such as flatness, translucence, abstraction and realism. 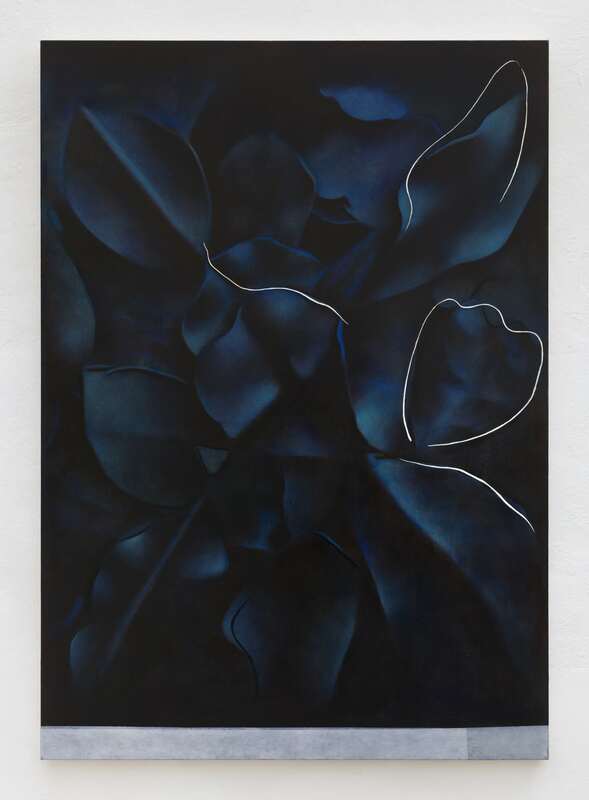 A new body of black monochromatic paintings derive from Giovanelli’s studies of the Acanthus leaf and its use as ornament throughout classical art. Hand modelled by Giovanelli in shallow black plasticine relief, her Acanthus sculptures are manipulated and folded to form deep linear ‘X’ shaped creases that run diagonally from corner to corner. These are then painted to create dark abstractions that assert both the obliterative and the decorative; the ‘X’ functioning both as an authoritative crossing out, and as flirtatious kiss. Emphasised by underpainting revealed beneath and below the image; and finished with gestural glyph-like inscriptions on top of the illusionistic surface. Giovanelli’s works flit restlessly through a multiplicity of painterly strategies bringing together interruptions, false starts, and obfuscation into a corrupted yet beautiful polyphonic totality. Louise Giovanelli was born in London in 1993 and lives and works in Manchester UK. She completed her BA in Fine Art at Manchester School of Art in 2015 and is currently studying at Städelschule in Frankfurt Am Main, Germany. Her work was recently featured in The Anomie Review of Contemporary British Painting published by Anomie Press. Forthcoming exhibitions include a solo show at Manchester Art Gallery and recent solo exhibitions include A Throw to the Side, Warrington Museum and Art Gallery; Slow to Respond, Touchstones Gallery, Rochdale; From Here to Here, Part 1 & 2,The Grundy Gallery, Blackpool. Workplace Foundation is a new charity based in Gateshead in the North of England founded by Workplace. Workplace Foundation supports emerging and under-represented artists with a specific commitment to UK art scenes outside of London. Workplace Foundation is part of Arts Council England's National Portfolio.